The sudden death of Docteur Nico in Brussels is a tremendous loss for the world of African music—a loss made doubly tragic coming as it did in the midst of his long awaited comeback. Nico had been recording and releasing new material at a feverish pace hoping to regain his position at the top of the African music scene and to reap the monetary rewards which had always eluded him. When I saw him in April of this year, he was in Washington, D.C. trying to negotiate a deal with an American record company. At the same time, however, he was being treated for a blood disorder which had been troubling him for some time. The doctors who examined him appeared to have arrived at a satisfactory method of treatment and the problem did not warrant his hospitalization. With both his record deal and medical treatment completed, Nico left the U.S. to take care of promotional business in Europe and to explore the possibilities for a live concert tour. But things began to go awry almost immediately. When he arrived in Paris his belongings were stolen including his newest (and favorite) acquisition, a submachine gun shaped guitar (fortunately all were subsequently recovered). Upon his return to Kinshasa, his health began to deteriorate. As the months slipped by it was decided to fly him to Brussels for treatment but by then it was too late. Nico was born Nicolas Kasanda on 7 July 1939 in the Kasai Province of the Belgian Congo. His parents and elder brother were all musicians and it seemed natural for young Nicolas to follow in their footsteps. The break that Nico considered his biggest came when he was 14 years old. He had been doing some singing with local musicians and caught the ear of a Jewish businessman named Gabriel Musa Benatar, owner of the pioneering Opika recording studio in Leopoldville (Kinshasa). Benetar took a liking to Nico, bought him a guitar, and encouraged him to practice with it. The rest, as they say, is history. 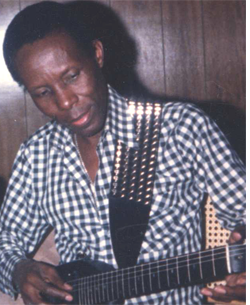 Docteur Nico went on to become the predominant guitarist in African popular music in the 1960s and 70s. Musicians across the continent were influenced by his incredible work. The name Docteur Nico became more recognizable than the names of kings and presidents. Unfortunately, recognition and record sales never brought the money Nico thought he was entitled to. He felt that he had been exploited and cheated by his record companies—a situation he sought to correct through his recent alliances with Africa New Sound and The African Music Gallery. The tragedy of the passing of this great musician is mitigated only by the knowledge that he has left us so much wonderful material. There are enough new recordings for several albums and his old hits will undoubtedly be re-released. So even in death Docteur Nico will make his presence felt. The new generation of African musicians has already borrowed much of his style and technique. As we mourn the passing of this brilliant artist, we should give thanks for the great pleasure and enjoyment he brought to a troubled planet. He was truly, as he liked to say, “dieu de la guitare,” god of the guitar. This article first appeared in West Africa magazine, 21 October 1985.